On ESXi 5.5, you try to update vmware tools on a guest VM, but receive the following error. I followed KBA http://kb.vmware.com/kb/1037405 and opened a putty session to the ESXi host and ran the following commands. vMotion the VM to another esxi host in the cluster. Try the vmware tools install/update again. This worked, but there were other VMs on the original host that had the same error. Use the VMware Tools Operating System Specific Packages (OSPs) https://www.vmware.com/support/packages for the specific build of the ESXi host running the guest VM. The problem – This may not be a company standard and you don’t want to go down the route of one off’s. It turns out the /store/packages/ only had 5.5.0 folder. After speaking to a few peers someone admitted they upgraded this host from 5.0 to 5.5 by mistake and then downgraded back to 5.0. The rest of the hosts in the cluster were 5.0. Used winSCP to copy the 5.0 folder from /store/packages/ on a 5.0 host in the same cluster to the problematic host. 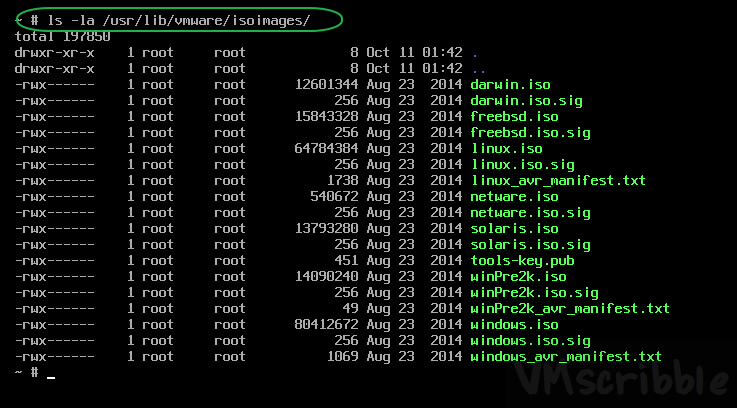 ls -la /usr/lib/vmware/isoimages/ command worked. The screen cap shows 5.5.0, but it was 5.0 when this happened. The VMware Tools install/update worked with an error on the rest of the VM’s on the esxi host.